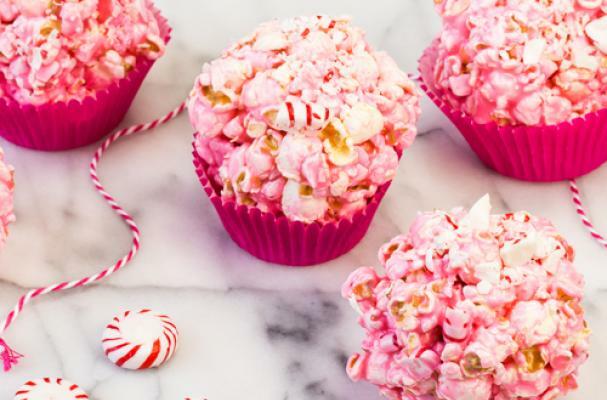 Peppermint popcorn balls is fun holiday for for the whole family. Similar to Rice Krispies Treats, these kernels are glued together with melted marshmallows and butter. Crushed candy canes impart the peppermint candy while a few dots of red food coloring add a festive colorful touch. Step 1: Spray large bowl, rubber spatula and piece of waxed paper with cooking spray; set aside. Pop kernel corn according to package directions. Remove all unpopped kernels and place half of popped corn (about 8 cups) in bowl. Step 2: Place 2-1/2 cups marshmallows and 2-1/2 tablespoons butter in microwave-safe bowl; microwave on HIGH 45 seconds or until marshmallows melt and mixture blends together smoothly when stirred. Stir in 1 teaspoon extract and 2 drops gel food coloring. Step 3: Pour marshmallow mixture over popped corn in bowl. Toss with rubber spatula to coat. Step 4: Add 2/3 cup crushed candy and stir to combine. Divide mixture and shape into 6 balls. Place on waxed paper. Step 5: Repeat above steps with remaining popped corn, marshmallows, butter, extract, food coloring and candy. Step 6: Sprinkle crushed candy on top of popcorn balls before serving, if desired.